The multi-channel purchasing journey, i.e. the process a consumer goes through before buying a product, is constantly changing; customers demand better, simpler, less expensive paths to purchase, as well as a combination of services and channels. Offline stores have always been an integral part to this journey, but as ecommerce grows and evolves, so must the High Street. Click and collect allows customers to buy a product online and pick it up from one of their offline stores at their convenience. Click and collect is a service not to be overlooked by businesses wishing to link their online and offline channels and fundamentally, if done right, it can improve conversions as well as sales online and offline. Halfords has said that 85% of their online orders are picked up in store which demonstrates that click and collect works. Argos, named the UKs best multi-channel retailer last year by Retail Week, has been using click and collect as a method to grow sales for years now and has seen a lot of success with it. In addition to offering click and collect, Argos went a step further by offering 'Fast Track', meaning customers can pick up on the same day. 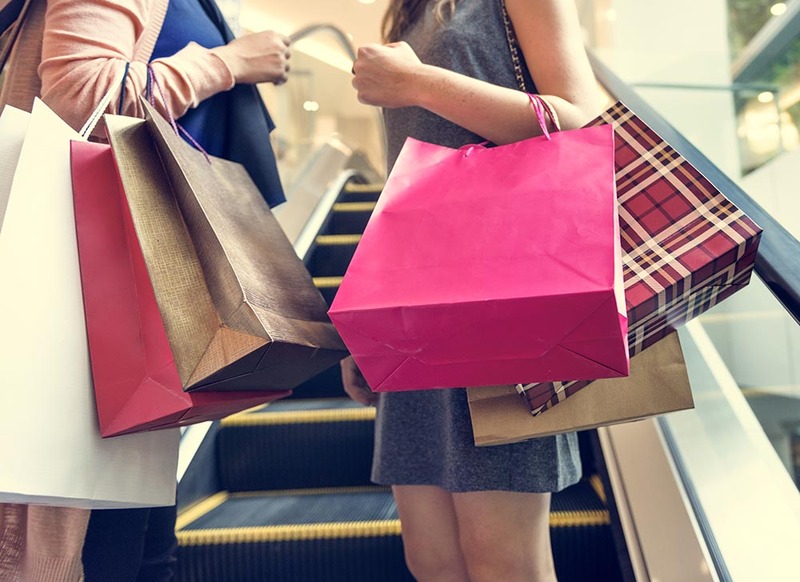 Their ability to align their offline and online strategy has been a contributing factor to the retailer obtaining the title of the UKs best multi-channel retailer. Now imagine the benefits specified above, doubled. 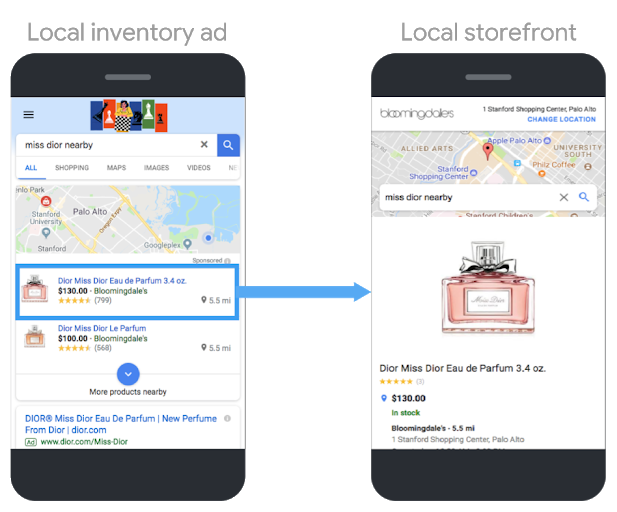 As you can see from the image, clicking on the ad takes the consumer to a Google-hosted store-front where store hours, proximity, price, rating and stock are made available. What you can include in your listing all depends on your Google My Business (GMB) account, so head over to our article on LIAs and see how you can create LIAs and optimise them through GMB. It’s worth mentioning, however, that like Google’s product listing ads, your LIAs are heavily reliant on product data. This means that for your ads to appear to relevant shoppers, you’ll need up-to-date, attribute rich product data feeds. In addition, strong order-management is vital so that your LIAs consistently receive up-to-date stock information on a store level. Most importantly, since Google carry out very stringent in-store inventory checks, its vital that in-store stick data is correct. Speak to us if you'd like some help or advice. You can use Intelligent Reach’s Data Management module to optimise and ensure you’re reaching as big an audience as possible. The module makes it easy to visualise, edit and distribute your product data. An additional feature of LIAs, however, is the ability to include a click and collect feature in your listings. 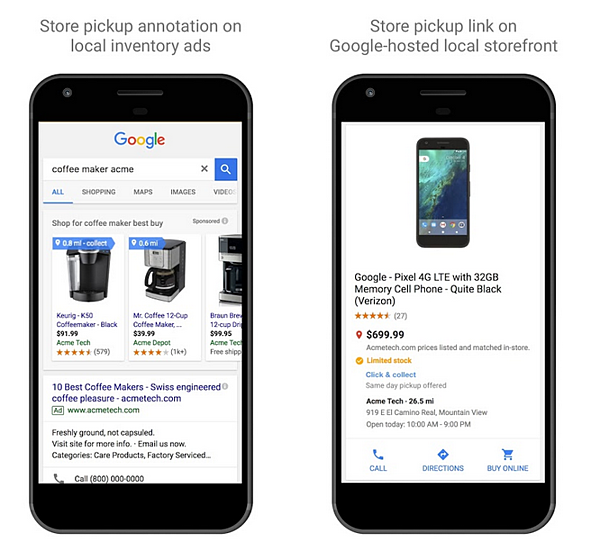 The Google Merchant Centre allows retailers to provide a click and collect annotation on their Local Inventory Ads which as a result, makes your LIAs even more effective, directly connecting online with online. Let’s say our consumer, Amy, is commuting; she’s running late and, as she suddenly remembers, it’s her colleague's birthday. She will have to pick something up before work and knows what her colleague wants, so she begins browsing on her phone. Amy types “coffee maker near me” into Google Search and is shown listings from stores in relative proximity to her. She clicks an ad and spots “Click & collect” but offers no inventory information, which doesn’t guarantee same-day pick-up. It's no good. The second ad, thankfully, offers inventory information and click and collect. Knowing it will be immediately available and ready for collection is a huge relief and she purchases it online. Amy heads straight to the store, picks it up within a few minutes and whizzes off to work. The ability for shoppers to come into the store, check and pick up an item lowers the possibility of a refund and allows for up-selling. It also removes the risk of damage in transit, meaning there's less of a chance fraud or that the customer will request a refund. If you think of it from the perspective of a consumer, you’ll realise just how impactful a click and collect feature, combined with inventory information can be. Be able to display your product page based on the codes from your Google My Business account in order to populate shop-specific pricing and availability. Bricks-and mortar stores (especially busy ones) unprepared for click and collect, meaning customers can be waiting a long time for their item. Ensure stores prioritise click and collects or provide separate desks for the service. Customers not able to return their click and collect items in-store, creating extra hassle for your customer. Ensure they can exchange or return items through stores. Consumers unsure of how long they will have to wait for item to be delivered to store. LIAs provide the perfect solution to this by showing stock information on the ad. Streamline this store inventory information across channels and your customers will know whether they must wait a couple of days or collect the same day. So, if you aren’t already offering click and collect, be smart about it and learn from other retailers’ mistakes. In Addition to LIAs, some popular marketplaces offer click and collect, too. When a shopper buys an item, they have the option to have it delivered to an eBay Collection Point location nearest to them. Sellers may also be signed up automatically if items match the requirements. You can find the requirements here for providing this service on eBay. With over 13,000 pickup locations, Amazon’s Click and Collect service is a good opportunity to provide better CX. As long as the items fit the requirements, they can be sent out at Amazon's locker closest to the shoppers' location. Ready to begin with Local Inventory Ad click and collect? Yes? Then for the technical information read here and get in touch with us if you’d like us to lend a hand with your LIAs.